Thanks to economic initiatives such as the Greater Bay Area and the (admittedly controversial) completion of the HZMB, an increasing number of HongKongers are getting reacquainted with Zhuhai, a tranquil resort town at the mouth of the Pearl River Delta. The city was designated a Special Economic Zone in the 1980s but has maintained an even longer running reputation as one of China’s premiere tourism destinations. Low population density, sub-tropical temperatures, lush greenery and plentiful access to fresh seafood all combine to attract millions of visitors annually — offering a holiday experience that contrasts sharply with the furore of neighbouring Macau (Zhuhai actually lies northwest of the latter, and day trips between the two cities via a series of border crossings are a frequent occurrence). 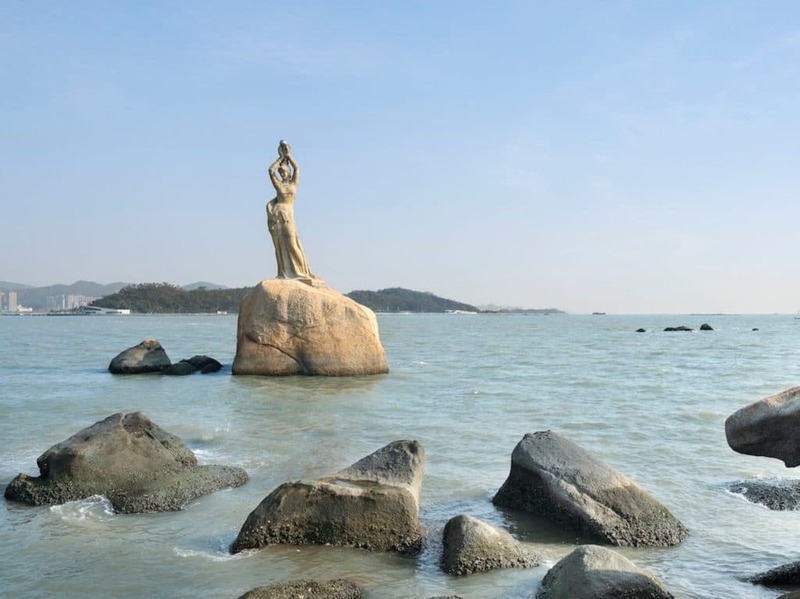 At Xianglu Bay, tourists can spot the iconic “Fisher Girl”, the unofficial folklore inspired emblem of Zhuhai that was erected in 1982. 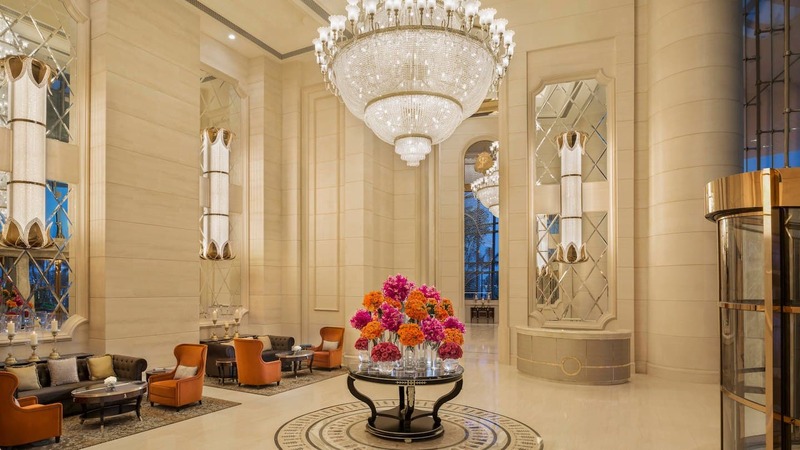 Incidentally, it’s no surprise then that an increasing number of international hotels are also present: now, the likes of Pullman and InterContinental are joined by the St. Regis — Marriott International’s quintessential luxury brand. Having opened its doors in October 2018, we recently got the opportunity to step inside the 10th House of Astor in Greater China, and experience a much-needed dose of old school hospitality on the Chinese Riviera. The St. Regis Zhuhai captures many of the iconic motifs that harken back to the first Beaux-Arts inspired property of the same name. Thanks to Wilson Associates, guests can expect plenty of crystal, an intricate web of chandeliers and regal tones of cream and gold. The 31-storey St. Regis Zhuhai is situated on the uppermost floors of Shizimen — a 320-metre development that forms the lynchpin of the surrounding Zhuhai Convention Centre (its external visage may remind you of a certain sky-high Ritz Carlton). Blessedly, the interiors capture much of the Beaux-Arts verve for which St. Regis is internationally renowned. Upon arriving at street level, guests are greeted by a palatial lobby that is evocative of the original Fifth Avenue locale. “Zhuhai has never had a true luxury hotel before” says PR Manager Iris Wang, “so from the beginning, we were determined to translate the essence of the first House of Astor to this newest setting in Greater China”. To achieve this, Marriott International has spared no expense: a veritable network of 500 chandeliers bejewels the property; fresh flowers by premium florist Ellermann are shipped in weekly; and Caroline’s Four Hundred — the signature scent of “exotic wood, apple blossoms and champagne” named for St. Regis matriarch Caroline Astor — permeates the corridors. The hotel’s exacting duplication of 19th century New York is complemented by an adherence to tradition. Guests can expect all of the brand’s signature “rituals” at the St. Regis Zhuhai. From evening sabrage to a fastidious butler service — available to all guests — that unpacks, presses and otherwise indulges every whim, service in the grand old House of Astor tradition is attentive and ever-present. Given the setting, these signature touches are even more profound: 5-star hotels are a dime a dozen in China; yet few rely on anything other than scale to solidify their credentials. That’s particularly true of a city like Zhuhai, where a laissez-faire attitude to hospitality has (up until recently) been the norm. 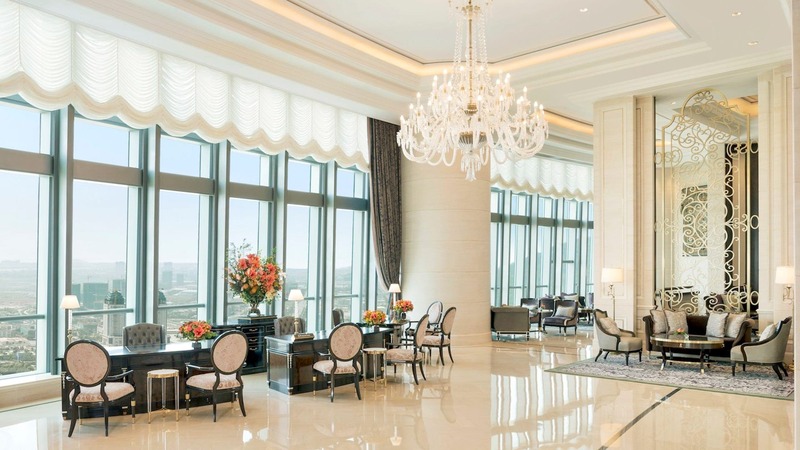 The St. Regis Zhuhai’s 251 rooms are divided into 6 categories. Each channels the grandeur of the brand’s original New York location (founded over a century ago), albeit with best-in-class amenities like the 5.1 channel B&O speakers and signature whisky trolleys. With entry-level accommodations starting at 60 sqm, the St. Regis Zhuhai offers up a very visible upgrade over most SAR hotels in terms of space and privacy. A consistent design vocabulary is applied across all rooms, heavily centred upon white marble, crystal lighting, leather upholstery, embroidered wallpaper and gilt metalwork. Amenities are similarly extravagant, encompassing everything from looseleaf TWG teas to mixers from UK-based brand Fever Tree. 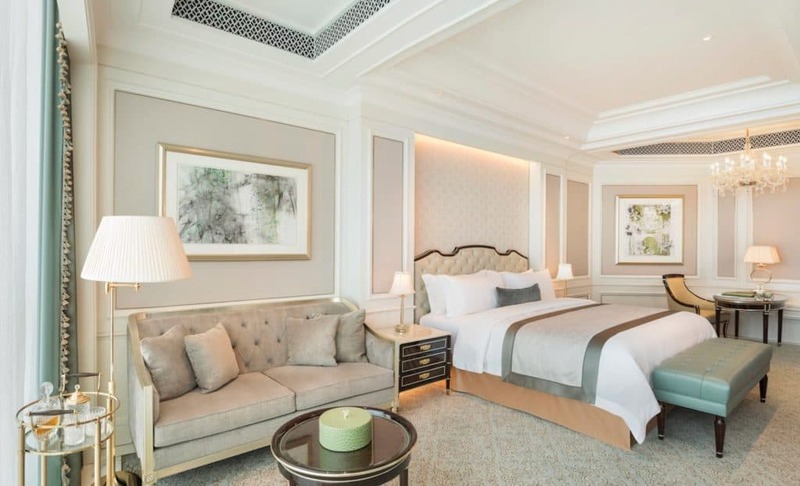 Across all six room categories, guests at the St. Regis Zhuhai will find positively verdant bathrooms that boast high ceilings, stained glass and soaking tubs with a view. Bathrooms are always a highlight at any St. Regis, but even more so in this property’s assorted suites and Ocean View rooms — all of which feature a winning combination of oversized bathtub and floor-to-ceiling windows. 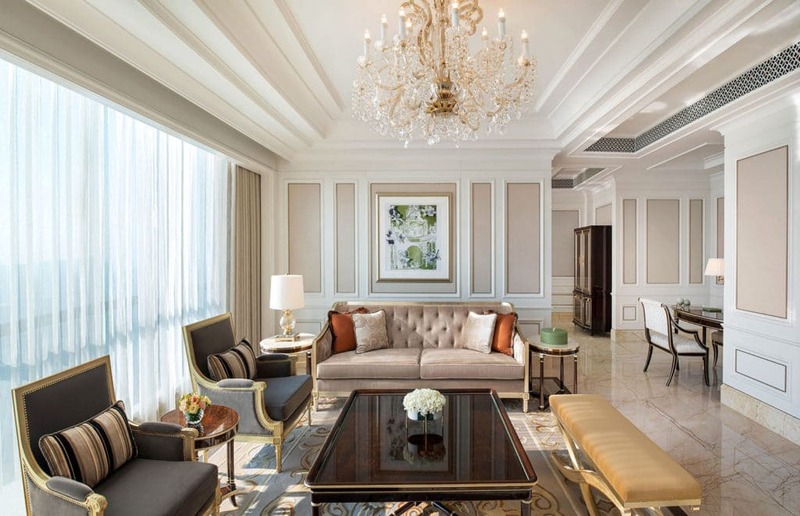 The spatial realm which the St. Regis Zhuhai occupies means that the hotel’s various suites are easily able to accommodate upwards of half a dozen guests at any one time. The Caroline Astor suite is illustrative of this: including distinct dining and living spaces; two bathrooms; and a master bedroom sprawled out over 200 sqm. Present at sister properties in Shanghai, Singapore and Changsha, Yan Ting is St. Regis’s iconic region-wide Chinese fine dining concept. In Yan Ting Zhuhai kitchen, Executive Chef (and native Hongkonger) Tang Wai Men overseas a menu of classic Cantonese cookery and intricately made dim sum. From the open kitchen at La Brezza, Chef Michele Tenzone creates clever twists on timeless Apulian classics, in a sophisticated setting bedecked in gold metalwork and portoro marble. In addition to Chinese and all-day dining options, La Brezza (located on the 71st floor) invites guests to experience an exalted vision of coastal Apulia. Chef de Cuisine Michele Tenzone (formerly of the Michelin-starred El Celler de Can Roca) hails from the capital of Bari, and this heritage is keenly suffused throughout the menu. Essentials from his home region such as olive oil and mozzarella are sourced direct from PDO certified producers; and these touchstones serve to ground the cooking — it’s light, focused and inflected with just a surreptitious hint of molecular gastronomy. Diners can expect inventive twists on classics such as suckling pig, lobster ravioli, freshly shucked scallops, and an addictive tiramisu which appears to have been crossbred with semifreddo. While it may not command the imposing 71st storey views of its rooftop counterpart, the indoor pool at the St. Regis Zhuhai is perfect for those looking to pack in a seriously stylish workout. An indulgent spa experience has always been central to the St. Regis manifesto. The brand’s Iridium Spa is well known throughout Greater China so it’s no surprise that St. Regis Zhuhai is getting its own branch of this upper crust institution. Nine treatment rooms comprise the space: all fitted with Living Earth therapy beds and combined shower/steam rooms. Signature treatments are diverse and topical: ranging from a chakra balancing massage to the “Bloody Mary Spa” — a three-stage treatment inspired by the quintessential St. Regis cocktail of the same name. Guests who prefer more active forms of relaxation are able to take advantage of not one but two heated pools, along with the St. Regis Athletic Club. The latter is home to an extensive assortment of the latest cardio and resistance equipment from Technogym, with in-house trainers also only a phone call away. It bears mentioning: for timid travellers, a quick jaunt to the Chinese mainland — to visit a prefecture-level city no less — might seem altogether too troublesome. But stifle the urge to negatively predict the kind of experience you’re going to have, and there’s plenty to recommend Zhuhai, and by extension, its first bona fide luxury hotel. From Michelin-worthy cuisine to a location that’s so close to Macau it borders on satirical, the St. Regis Zhuhai is a property that has the makings of a region-wide institution. Apropos of the China experience, there were occasional missteps with service — a jacket sent out for pressing was delivered by our butler half an hour behind schedule — but these problems often arise in hotels which have only been open a few months, no matter the scale. More importantly, when such hiccups were conveyed to staff, they were warmly registered; and a visible effort to correct the problem always followed. That’s more than we can say for a lot of Hong Kong hotels.